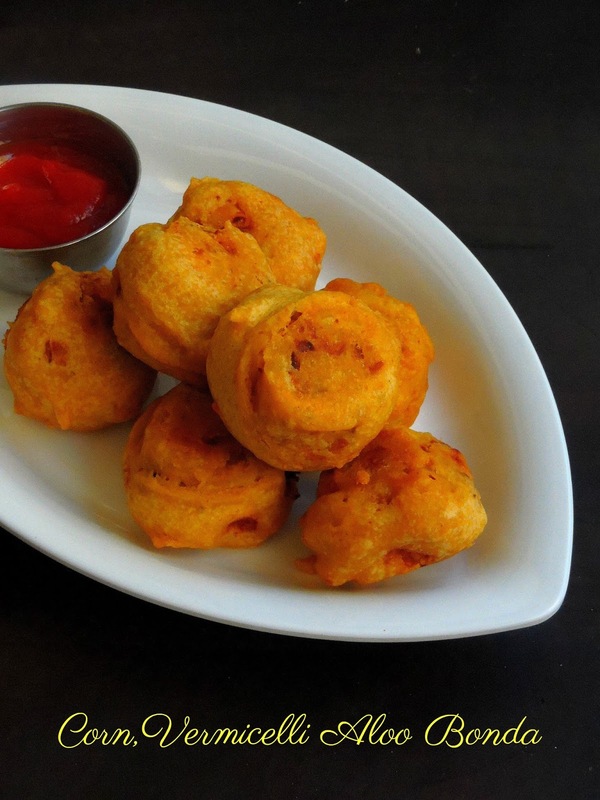 Aloo Bonda/Batata Vada aka Potato bonda is a simple and tasty evening snack to enjoy with a cup of tea or coffee. Usually prepared with a simple onion mashed potato filling, these bondas tastes super delicious when served along with coconut chutney,but my today's post is definitely a innovative dish. Yes mine is quite a different from the usual potato bonda. I have prepared this fried beauties with cooked vermicelli and sweet corn kernels along with mashed potatoes. Adding corn kernels to this simple potato filling brings some crunchiness to this bonda.Actually am posting this crispy Aloo Bonda for this month's Shhh Cooking Secretly event started by me, which is now hosted by Mayuri Patel. Japanese Sesame Cookies, if you are looking for something super crunchy, nutty then you should look at my today's dangerously addictive Sesame Cookies. These cookies are eggless but not vegan, as milk and butter are used for binding the flour and other ingredients. With simple ingredients, you can bake out this ultimate Japanese sesame cookies with less efforts. 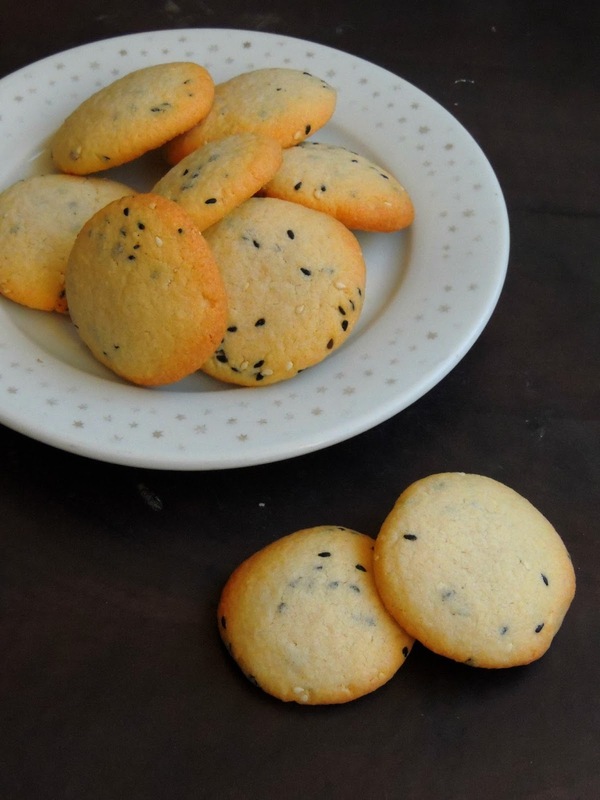 Loaded with both black and white sesame seeds, this cookies are damn flavourful with super nuttiness. I bookmarked this cookies while we were running Mega marathon from Ruchi's Space, while she got this cookies from Gayathri's space. This cookie dough calls for oil, but i couldnt stop myself to add some butter to oil to bake this cookies somehow buttery. Pinca/Pinza, this sweet bread is baked in Croatia especially during Easter holidays. Traditionally baked with loads of eggs, this bread will be super rich, soft and beautifully flavoured bread, obviously which will definitely tickle your tastebuds. Though earlier lard is used in this bread, nowadays Pinca is made with a butter and flavored with either with citrus zest or with orange zest, along with candied or dried fruits with some rum or rose water. Obviously this bread is a must for Easter table as Pinca remained as centrepiece of most of the Croatian Easter breakfast table. Pinca is often taken to Easter mass for blessings which is later given as a symbol of good wishes. My love for Chinese foods, always pull me to cook different dishes from this cuisine often at home. If you cross a bread from this Cuisine, how can you resist to keep yourself away from trying your hands with it. Yes i crossed this Uyghur Nan bread at Ritu's Annapurnaz while we were doing a month of blogging marathon with different International cuisines. 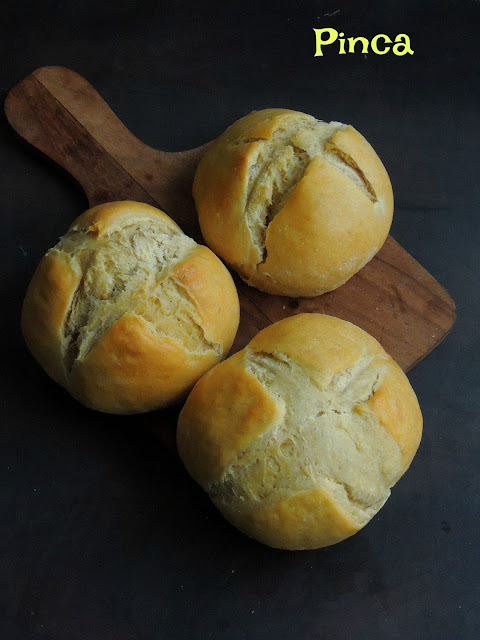 When i landed to her space to read her post, i completely fell in love with bread as this bread was very easy to bake. Obviously i gathered all the ingredients and baked this cuties at home. 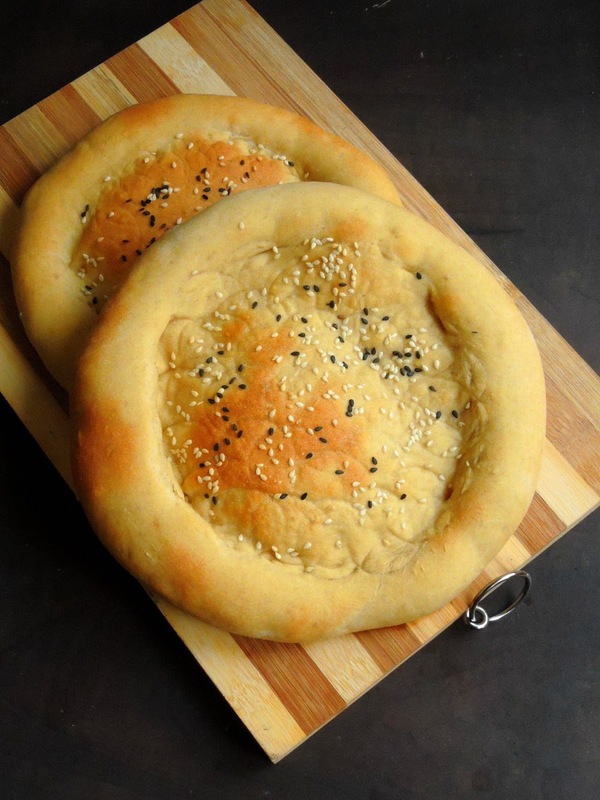 This Uyghur Nan bread is quite popular bread easily available in Xinjiang, China. This Bread is baked usually as a big, flat or disc shaped bread with thick edges and thin middle. Actually this bread is pricked with nail studded stamp called Uyghur bread stamp. After a chinese sauce and a simple sour pickled cucumbers, am going to take you all to Indonesia. Actually to be honest, Indonesian cuisine is becaming one of my favourite cuisine recently. Their cooking skills are simply fabulous. With easily available ingredients and with less efforts you can dish out many interesting Indonesian dishes. Actually you wont miss Indian style of cooking while trying your hands with this particular cuisine. Needless to say since this cuisine is an Asian cuisine, you will definitely notice that this cuisine calls for chillies, ginger, garlic as much as Indian cuisine. Obviously if you want to try your hands with this cuisine, just start with simple dishes and am sure you will keep on exploring this incredible cuisine. You will definitely forget to shop pickled gherkins or pickled vegetables, if you make yourself at home. Pickling vegetables at home is definitely an easy way to conserve your favourite vegetables. Though am a great fan of Indian style pickles, i dont forget to make some simple pickled vegetables at home to bring the sourness to homemade burgers or to tickle our tastebuds while preparing a meaty sandwich. One of the easiest pickle is pickled cucumbers. 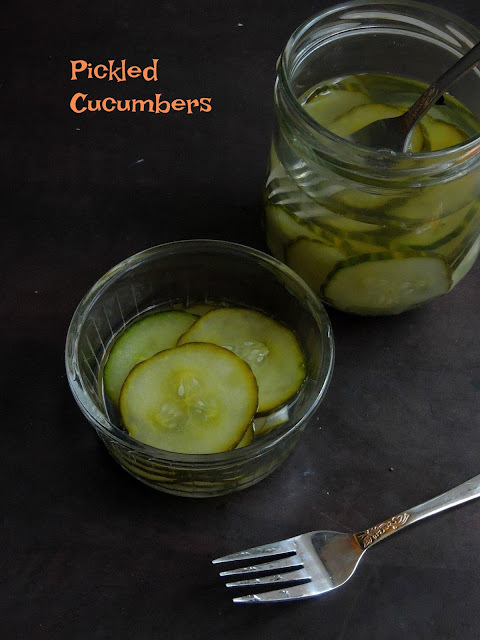 Though pickling cucumbers may varies, my today's post is one of quickest method. With simple ingredients, you can simply get a bottle of pickled cucumbers with less efforts. 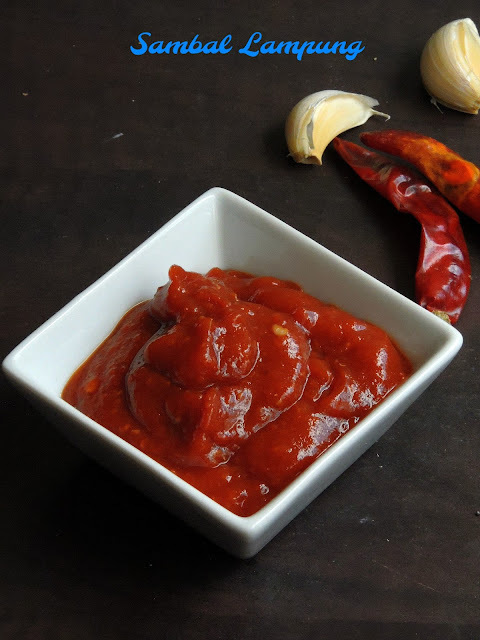 Nothing can beat homemade spice powders, sauces or else dips. Since they are homemade no preservatives are added, hence they are harmless for the health of our family members. Though some sauces or spice powders are seriously hard to be prepared as homemade, we dont have any other choice than picking them stores. However if you have an option to prepare yourself the spice powders or sauces at home, dont hesitate a second as they may be sometime very easy to dish out. Coming to my today's post, I am an ardent fan of chinese dishes.Obviously i love to prepare their dishes often at home. Some of the chinese sauces are seriously hard to prepare eventhough few of their sauces can be prepared at home with less efforts. 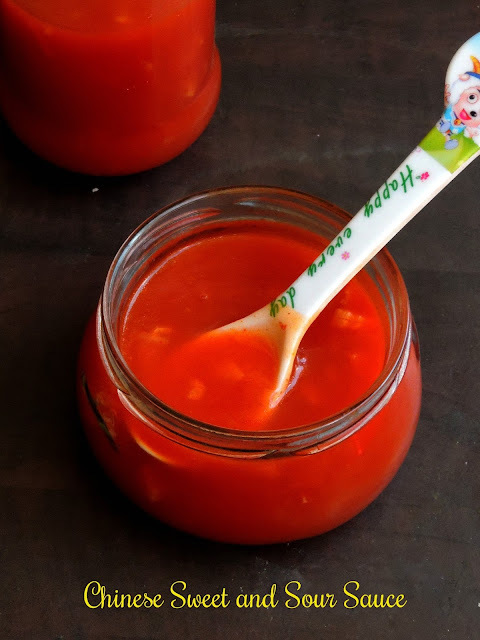 One among those sauces is my today's recipe aka Chinese Sweet and sour sauce. Fudge, this incredible sweets are seriously very easy to dish out as this dish goes for very simple ingredients and easy cooking process. Sweetened condensed milk, chocolate chips and a handful of nuts is quite enough to prepare your own dose of some ultimate chocolate fudge at home. Since this sweet is very quick to dish, i do often prepare this fudges at home with different ingredients. Though my kids favourite fudge is always caramel fudges, i just love chocolate fudges. 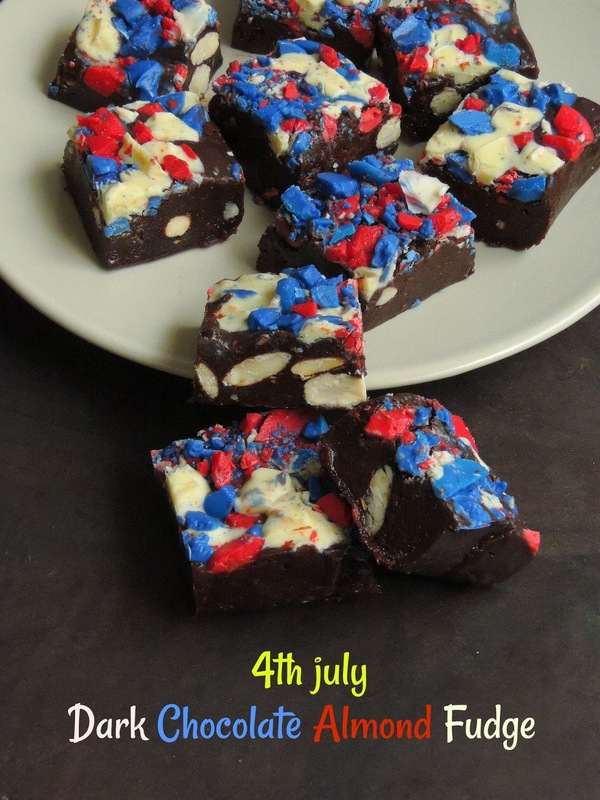 My today's post is an another simple fudge to dish and pack for a gift or for a picnic to munch. 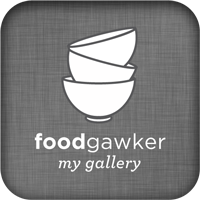 I used 80% dark chocolate for preparing fudge as i love 80% dark chocolate to munch. Not to forget that these dark chocolates are rich in magnesium. After preparing some easy breezy Rice krispies treat, i couldnt think more than baking a cake. My today's post is a very easy cake as well. I opted for bundt cake pan, but still you can bake this buttery cake simply as pound cake with a loaf pan as well. You can bake this cake as a marble cake but i still bake as simple tri colour cake just by dropping the coloured cake batter with no-colour cake batter one over one. A surprise cake to serve and enjoy along with your friends. 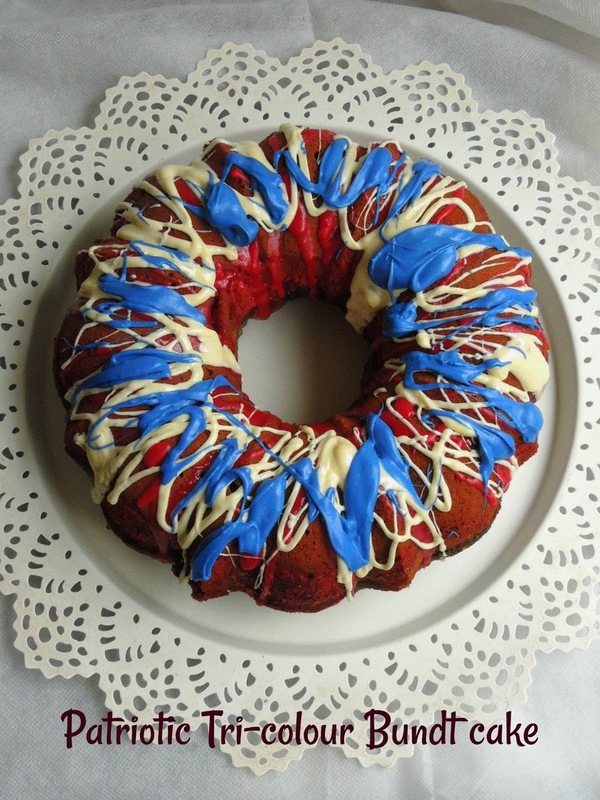 A prefect cake to celebrate the 4th July day as this cake prefect to pack for your picnic or attending a barbecue. Simple to bake, this cake is definitely a stylish one to place as a center piece in your dinner table on the National day. This week's blogging marathon theme is Easy 4th July dishes, though French peoples celebrates their National day on 14th July, Americans celebrates their National day on 4th July. Since this day is a National holiday, Americans spend their day often by celebrating either by hosting or by attending a picnic or barbecue. 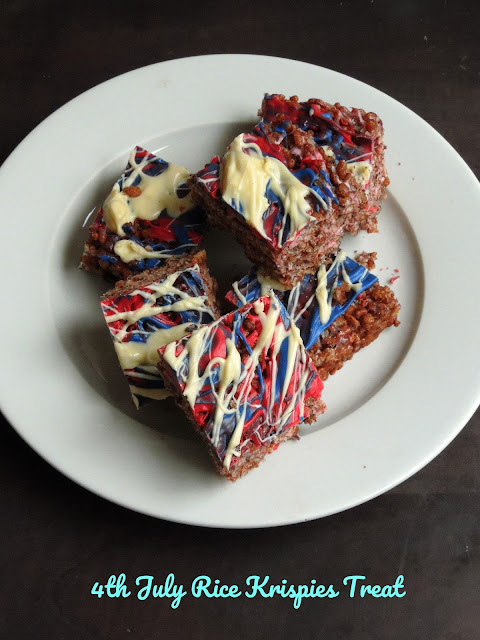 Obviously when you are supposed to prepare something easy and simple to pack for this day, i couldnt think more than preparing some easy breezy Rice krispies treats. Whenever i make this simple rice krispies, it gets generally disappears so soon from my kitchen counter and i rarely get a chance to save a slice for next day. 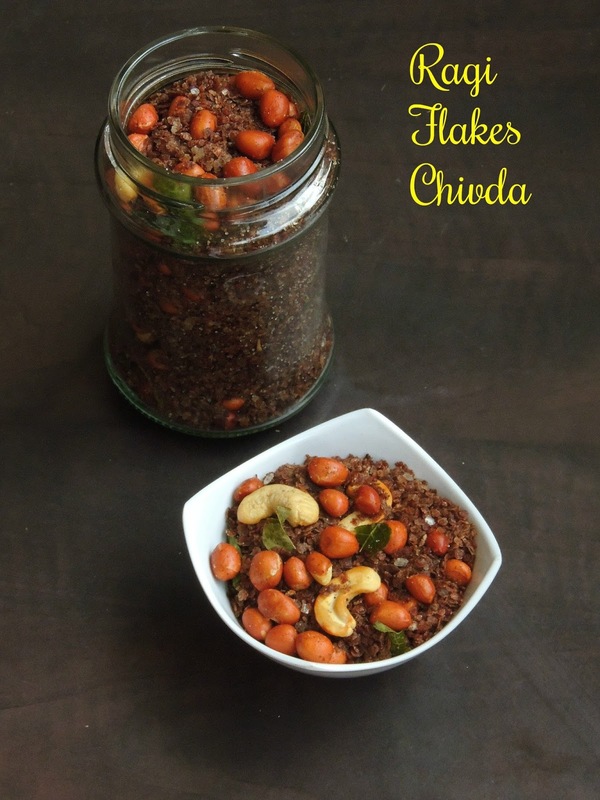 Chivda, this easy breezy crunchy snacks gets ready very much easily and ready to munch with less efforts.During my last trip to India , i got some packets of wheat flakes, ragi flakes from organic stores. Actually i bought those packets just to make chivdas back home. Both wheat and ragi flakes works wonder for making some interesting quick chivdas. I have prepared this chivda long back and this dish was sitting in my draft since a year. Finally i have a prefect theme to post this incredible chivda. 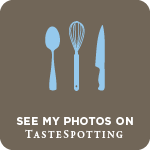 Yes my theme for this week's blogging marathon is Recipes with Wholegrains, i have already posted two incredible dishes with both broken wheat and quinoa. To finish this theme, i couldnt stop myself to post this chivda which was sitting for a while in my draft. If you get this flakes, dont forget to dish out this chivda, as they are extremely healthy. I can stop myself saying that my all time favourite wholegrain after Oats is 'Quinoa', i just love to cook with this wholegrains. Though i can get this grain from Organic stores, i just cant stop myself picking them whenever i cross an Organic store. Its been quite a routine for me to cook with quinoa, not to forget that this grain is seriously very versatile. 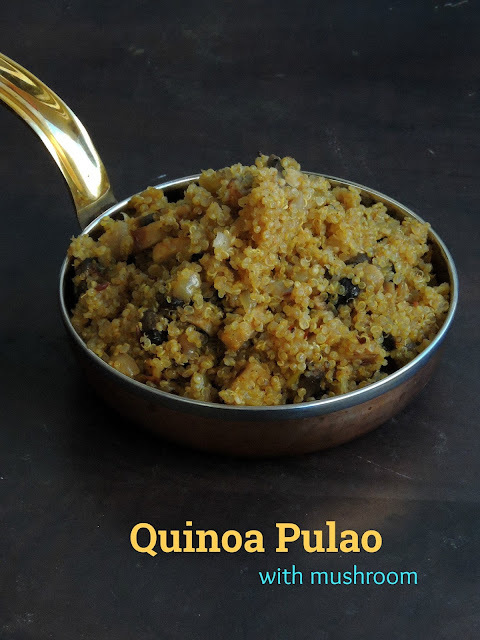 Quinoa suits prefectly awesome to cook any sort of dishes from breakfast to dinner, and they works tremendously to cook Indian dishes out of them. I have been cooking quinoa for the past 4 years and everytime i cook with them i feel like exploring something new with this grains. With their nuttiness, this grains are seriously easy to cook and trust me everyone at home love this wholegrain. Broken wheat, an extremely interesting ingredient to cook with, you can dish out many beautiful and delicious Indian dishes out of this incredible diabetic friendly ingredient. This broken wheat aka Dalia have its own place in my pantry. I just love to cook with this broken wheat as they are extremely prefect to cook from breakfast to dessert. 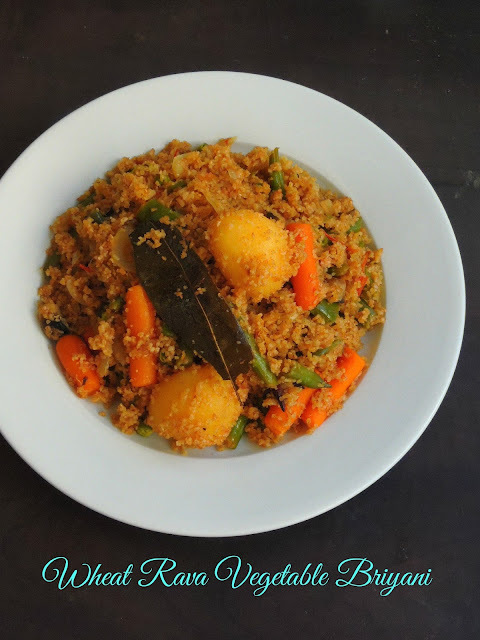 My today's broken wheat biriyani goes definitely for an easy version, with usual spices you can dish out this one pot meal quickly in pressure cooker. Cooking through pressure cooker makes our life easier, obviously if you are in hurry just go with pressure cooking. With handful of mixed vegetables this incredible, diabetic friendly briyani makes an excellent meal to serve along with your favourite side dish and raita.